Seat 7F 8F on the flight going down there. Sunday 3/26/2017 - Drive to Punta Nizuc. Hotels.com conf#: 136865746448. Booking has been paid in full ($273.01). Hotels.com 800-246-8357. 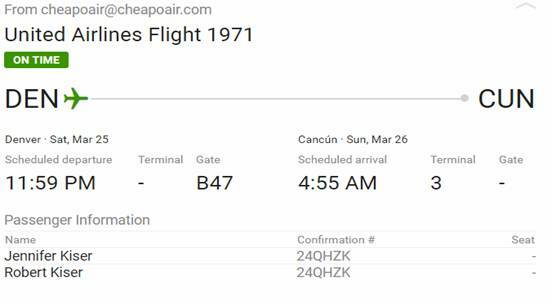 Check in: 6:00 a.m Sunday March 26th. Be sure to tell them Non-snoking. Check out: 12:00 noon Sunday March 26th. Hotels.com conf#: 136513249350. Booking has been paid in full ($248.01). Hotels.com 800-246-8357. 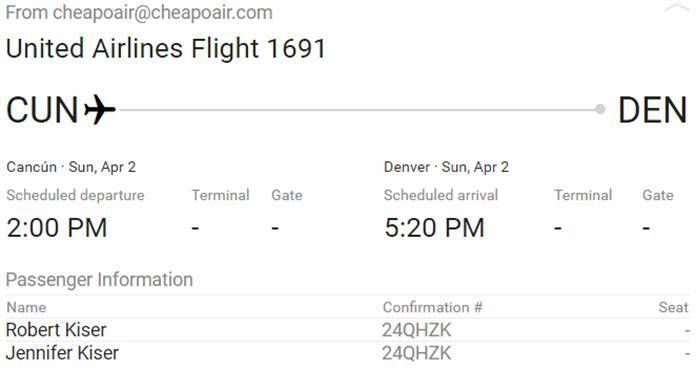 Check in: 3:00 p.m Sunday March 26th. Check out: 12:00 noon Monday March 27th. Monday 3/27/2017 - Drive to Chichen Itza. Spend the night there. Hotels.com conf#: 136514959118. Booking has been paid in full ($112.44). Hotels.com 800-246-8357. 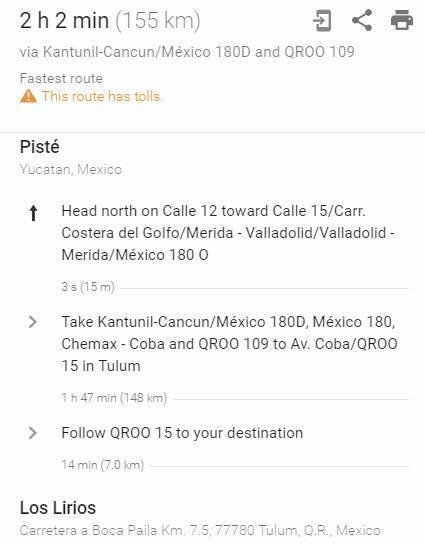 Tuesday 3/28/2017 - Drive to Tulum. Spend 5 nights there. Hotels.com conf#: 136514711764. Booking has been paid in full ($1,380.90). Hotels.com 800-246-8357. 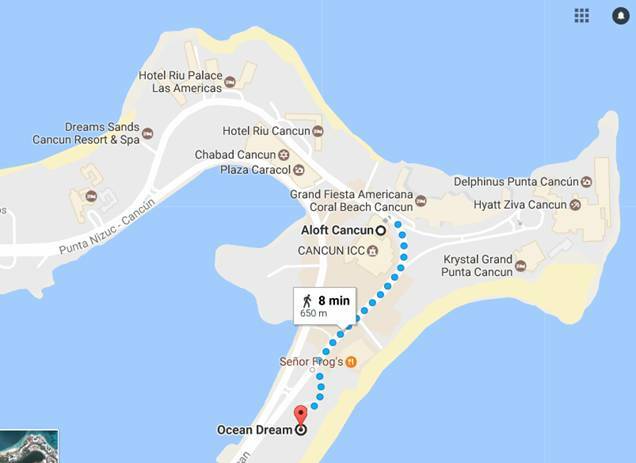 Sunday 4/2/2017 – Drive to Cancun. Address? They only say to use the airport address. · The minimum age is 21 years of age. There is no limit for maximum age. · Present an original and current drivers license, with photograph. · The titleholder of the rental, or the authorized additional driver, must present his/her current, original driver’s license, from the country of residence. We reserve the right to verify and accept the drivers licenses, according to the established norms by Caribbean Rent a Car, and negate the rental, in case of any omission or non compliance. · An official identification, current and with photograph IFE (for Mexicans) or, passport, current, with photograph, from the country of residence. · As payment for the rental of the vehicle, Credit or Debit Cards are accepted,(Amex, Visa, Discovery, Or MasterCard) traveler’s checks, Mexican pesos, US Dollars or Euros. Personal checks or travel vouchers are not accepted. We reserve the right to accept, or not, if the Credit or Debit Card is from a special promotion, in bad shape or is illegible. · Caribbean Rent a Car, reserves the right to decline the reservation or the rental of the vehicle, if the client does not cover satisfactorily the necessary requirements to carry out the commercial transaction. · NOTE: The guaranty is just A hold not a charge and it will be released directly by the bank card issuer after the end of the rent, according to the they re policies. 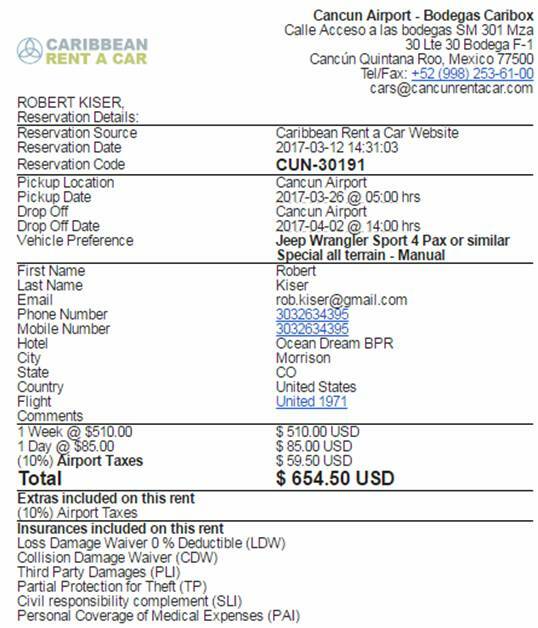 · Caribbean Rent a Car reserve the right not to accept any document, that are not legible or not visible. X Call Verizon. 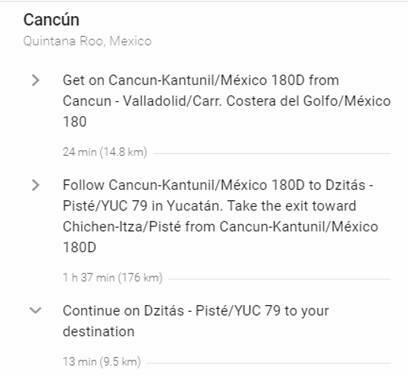 Will my phone work in Mexico? Yes. There is a $2.00 a day charge for using phones in Mexico. Both Jennifer’s line and mine are set to work in Mexico for an additional $2.00 per day. X 303-263-4395. No charge unless it’s used. For Mex and Canada, it’s $2.00 a day. Unlimited talk/text. Already active on the line. Activate it on her phone also. $2.00 per day. Woohoo! X Call United. Add frequent flyer numbers to my tickets. Verify seats are assigned. X Copy tracks off of Garmin Montana GPS. 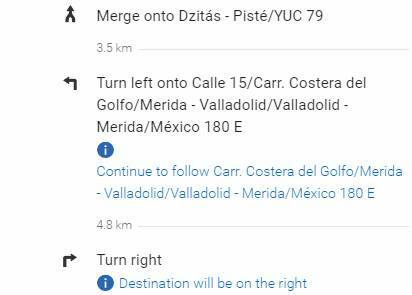 X Buy maps for Mexico and load them into Garmin Montana. I already had the maps on the Garmin Montana 600. Directions to hotel in Piste. 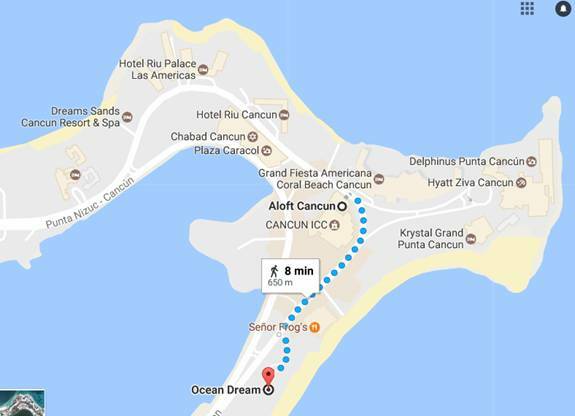 Directions to hotel in Tulum.